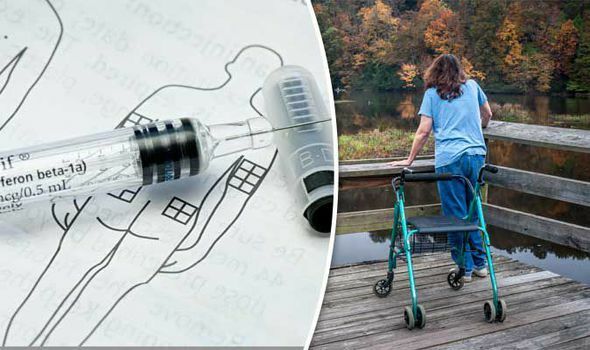 A NEW drug that creates natural ‘killer cells’ in the body has been hailed as a great leap forward in the fight against multiple sclerosis. The monthly jab works by rebalancing the immune system and increasing the number of the body’s own killer cells. It is hoped the drug - daclizumab - will be available to patients within months. Daclizumab has been licensed for use in the UK for patients with the relapsing form of the disease, the type that affects 80 percent of sufferers. Approximately 100,000 people in the UK suffer with MS. It causes inflammation, which damages the central nervous system, stopping the nerves from working properly. Symptoms include loss of mobility, speech problems, spasms and difficulties with thinking and memory. It has very few treatment options and often patients live for many years with the debilitating symptoms. In the DECIDE study, the largest clinical trial ever undertaken in MS, daclizumab was shown to reduce the frequency of attacks (or relapses), by 45 percent compared to interferon-beta-1a, the current standard therapy. It slowed the progression of the disease by 76 percent when compared with placebo over the course of a year and by 27 percent compared to interferon beta-1a over two to three years. It is also very effective at reducing the development of new brain lesions. Side effects include skin reactions and liver problems. Professor Giovannoni said: “Daclizumab is thought to work by targeting the growth of activated T cells, which are known to damage myelin, or insulating, sheath that cover nerve fibres. Nick Rijke of the MS Society, said: “We are delighted to see another treatment authorised for MS. We are now working with NICE to try to ensure that daclizumab is made available through the NHS. Last month, the University of Ottawa in Canada reported that patients given aggressive chemotherapy combined with a transplant of their own cells, were described as a close to being a cure for MS. The chemotherapy destroyed the immune system instead of suppressing it as in standard treatment. It was then “reset” using blood stem cells. But of the 24 patients who were treated, one died as a consequence and it was said the study was too small to assess the true dangers of the therapy.